In my previous post, I explained how we can call Asynchronous web service from Oracle Service Bus using soa-direct protocol. But in many scenario’s we need to invoke asynchronous web service from Oracle Service Bus using http protocol. 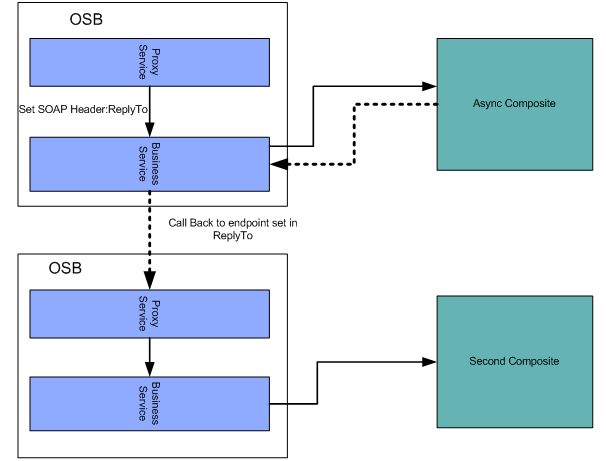 In this post I am going to explain how we can invoke Asynchronous web service (Async Composite) from Oracle Service Bus over http protocol and route the call back response from Asynchronous web service to another proxy service which in turn call another composite (Second Composite). 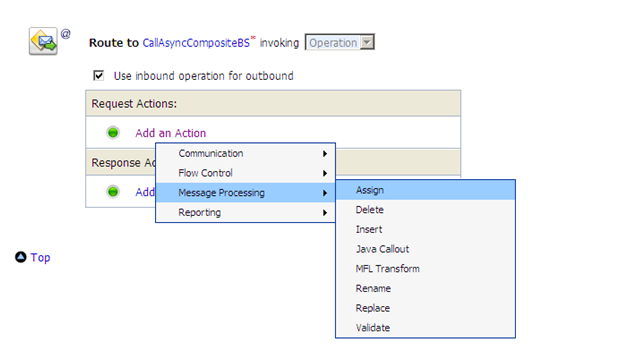 Follow below steps to invoke Asynchronous Composite from OSB. Create an Asynchronous Composite. 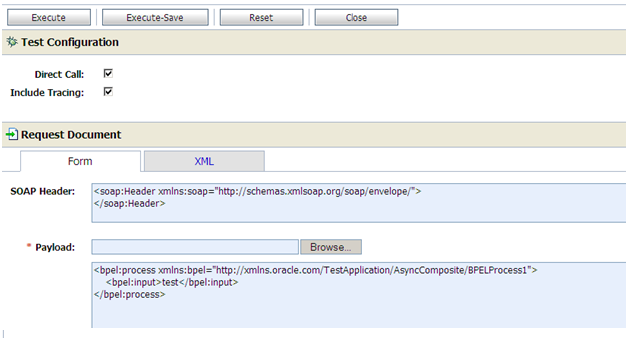 Name it “AsyncComposite” and deploy it on SOA server. Create a new OSB project and add three folders to it. Click on “resources” folder. Choose “XML Schema” from “Select Resource Type”, name it as “AsyncCompositeSchema” and add it to resources folder. Similar ways choose “WSDL” from “Select Resource Type”, name it as “AsyncCompositeWSDL” and add it to resources folder. Now create business service to invoke Asynchronous Composite. To do this click on “businessServices” folder, choose “Business Service” from “Select Resource Type”, name it as “CallAsyncCompositeBS”. 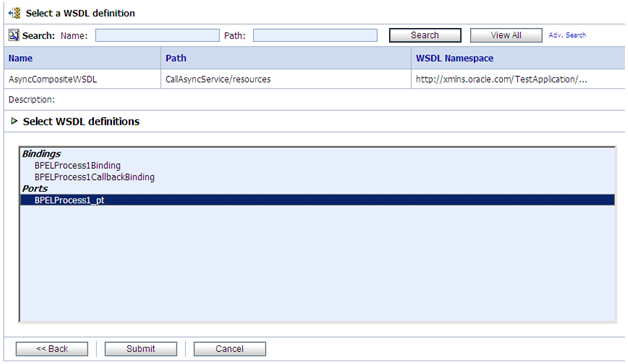 Choose “WSDL Web Service” as “Service Type” and browse to above added WSDL file. Then select the port and submit it. Accept defaults and save this business Service. 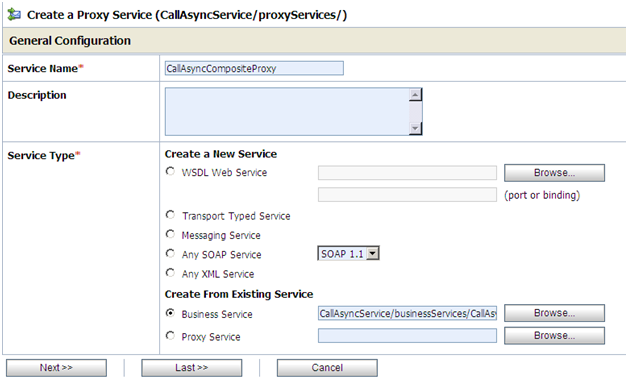 Now create proxy service to invoke above created business service. To do this click on “proxyServices” folder, choose “Proxy Service” from “Select Resource Type”, name it as “CallAsyncCompositeProxy”. Choose “Business Service” as “Service Type” and browse to above created Business Service. Accept defaults and save this proxy service. Follow below steps to get response back from Asynchronous Composite. 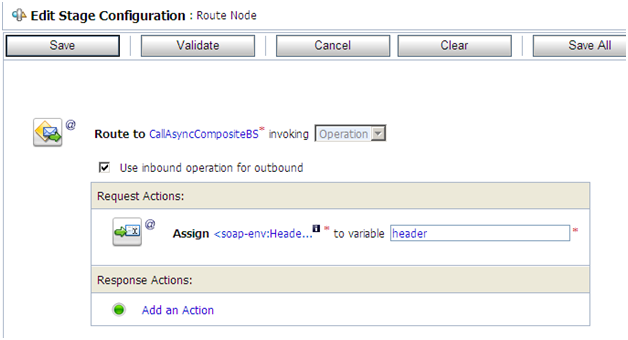 Create a synchronous or one-way composite, name it “SecondComposite” and deploy it to SOA server. You can create either synchronous or One-way as we created this composite to show that our call back proxy is working. Go to OSB project that we created above and click on “resources” folder. Add XSD and WSDL of SecondComposite to resources folder. Now create business service to invoke Synchronous Composite. To do this click on “businessServices” folder, choose “Business Service” from “Select Resource Type”, name it as “CallSyncCompositeBS”. 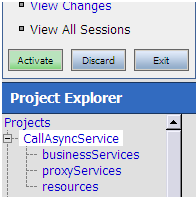 Now create proxy service to invoke above created business service. To do this click on “proxyServices” folder, choose “Proxy Service” from “Select Resource Type”, name it as “CallSyncCompositeProxy”. Note down the “Endpoint URI “. In our case it is “/CallAsyncService/proxyServices/CallSyncCompositeProxy”. Now we will complete the sample. We will configure “CallAsyncCompositeProxy” to send the call back response from Asynchronous Composite to CallSyncCompositeProxy. Go to CallAsyncCompositeProxy and click on “Edit Message Flow”. Right Click on route node and choose “Edit Route”. Add Assign activity to flow. Inside assign replace soap header to below one. Remember ReplyTo address refers to CallSyncCompositeProxy endpoints.